To Cite: Manoochehry S, Hoseinzadeh E, Taha P, Rasouli H R, Hoseinzadeh S. Field Hospital in Disasters: A Systematic Review, Trauma Mon. 2019 ; 24(2):e65126. doi: 10.5812/traumamon.65126. Background: Field hospitals (FH) can be mobile or fixed. The main goal of FHs is providing health care and preventing injuries caused by disasters or providing emergency medical operations. However, preparing a safe and fast-erupting structure and facility is very important. Objectives: In this systematic review study, field hospitals are reviewed. Methods: In the present study, a systematic review was performed following the PRISMA guideline. To identify the articles, MEDLINE, web of science, Google scholar, PubMed, Persian journals and databases were searched to find related papers. Results: After full text screening as the final screening step, 20 papers were entered in the study. Findings showed that structures used for establishing a FH are usually tents, using vehicles (trucks and buses), pre-fabricated steel, and concrete structures. The FHs were used for war and earthquake disasters. Conex, tent, steel, and concrete structure are the most used structures for FH in wars, while tents are the most common structure used for natural disasters. Conclusions: The present study reviewed available reports on FH to collect useful data that should be focused on establishment of an FH suitable for a disaster. Furthermore, this study provides a list of the most important indexes that must be considered in proposing a type of FH. Tent structure was the most common structure for the establishment of FHs. Copyright © 2018, Trauma Monthly. This is an open-access article distributed under the terms of the Creative Commons Attribution-NonCommercial 4.0 International License (http://creativecommons.org/licenses/by-nc/4.0/) which permits copy and redistribute the material just in noncommercial usages, provided the original work is properly cited. When natural disasters, such as flood, earthquake or man-made disasters (terrorist and war attack) occur, the importance of medical facilities is the most considerable (1). As data from the emergency events database (EM-DAT) of the centre for research on the epidemiology of disasters show, the global disaster rate is increasing (2). As EM-DAT illustrates, during the period of 1970 to 2008, developing countries had more than 95% deaths related to natural disasters. In addition, it can be concluded the disaster occurrence became more frequent, severe and destructive in the recent years, especially in developing countries (2, 3). When a disaster occurs it causes serious damage in health care services and leads to emergency health care needs. In case of Iran, as a one of the countries categorized as a developing country, the climate, geography, and geology make it one of the world’s top ten disaster-prone countries in terms of the frequency of unexpected events (2). Approximately, more than 31 types of natural disasters have been recorded in the history of this country. Furthermore, the Iran-Iraq War that was an armed conflict and took eight years (from 1980 to 1988) shows that unnatural disasters are probable to take place, as well. Therefore, health care systems and the establishment of FHs have a significant effect in decreasing the effects of these disasters and saving injuries. Establishing of FHs in these circumstances to save injures is an essential task. As soon as FH is established, a larger number of people would be saved thus there is a need to know suitable structure at each disaster or geographical location by management teams. If a disaster strikes a country, all political, economic and cultural infrastructures are threatened. However, all equipment and facilities must be mobilized to respond to the crisis (1). Furthermore, FHs are health care units with mobile or fix structures. These medical care units are used to save lives after striking of a crisis to a community or to temporarily take care of casualties on-site before they can be safely transported to more permanent hospital facilities (4). The term FH mostly refers to military situations, yet it can be used in natural disasters. The concept of FHs was born in World War II and the first surgical hospitals were brought to the frontline by Baron Dominque Jean Larrey, who was called the father of combat medicine (5). These types of hospitals consist of three or four smaller units, which are generally situated near the battlefield (6). Military FH is called mobile army surgical hospital (MASH) and was the first temporary medical unit to save soldiers in wars, such as Korea and Vietnam wars (5). Today, there are many kinds of medical care units with various structure and facilities that are used in wars as well as in other disasters to help injuries. Field hospitals are somehow different in comparison with hospitals in terms of architectural plans, structures, and even applications. Mobile FHs are not equipped with permanent health facilities because they are established for emergency not daily illness. Furthermore, FHs consist of a set of internal and external parts, which are interconnected. When a disaster strikes, FHs are used to provide medical services in crisis or abnormal circumstances and emergency situations, reduce the number of victims and disabilities due to delay of providing medical services, prevent from occurrence of epidemic by providing diagnostic and medical services, and reduce costs and possible injures (4, 7, 8). Field Hospitals can be employed after math of war as active auxiliary arms of the health system to provide health care in deprived and remote areas. When the number of victims and injuries are affected in certain areas, establishing a mobile FH is inevitable (9). Usually, a mobile FH in wars is made based on three principles of availability, health, and conditions of launching facilities such as water, electricity, and concealment (10). According to the importance of FH in saving injuries in crisis circumstances, as mentioned above, and since there is no comprehensive research that has reviewed these types of hospitals, the aim of this study was to present the latest information of hospitals in terms of structure, serviceability, placement, equipment, and other indices. In this research, field hospitals’ structure and facilities erupted during the disasters were reviewed. 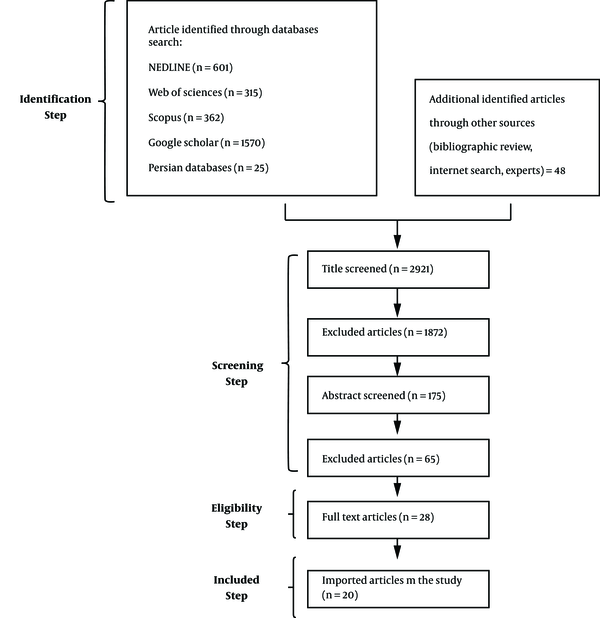 This research found 2921 papers at the screening step. At this step, the selection criteria were limited to title, while by more evaluation and abstract study, the selected publications were decreased to 175. At the eligibility step, 28 publications remained and finally 20 papers met the criteria and were included in the study. For extracted data included place, administrative organization, disaster type, year of occurrence, structure, equipment, and clinical team as the categorized themes (Tables 1 and 2). As Tables 1 and 2 show, structures used for establishing of a field hospital are usually tents, using vehicles (trucks and buses), pre-fabricated steel, and concrete structures, respectively. According to the present research results, the tent structures were the most common structures for the establishment of FHs when a disaster occurred. Iraq (10) British military War / 2003 Tent Emergency department, a 4-bedded intensive, high dependency care unit, a 2-table operating theatre, 50 medium-dependency nursing beds, radiological services with X-ray, ultrasound and CT, basic pathology and laboratory services -A transfusion capability of packed, red cells and fresh frozen plasma was available. general surgeon, orthopedic surgeon, consultant anesthetists, consultant in emergency medicine and, consultant physician supported by a small staff of junior doctors, nurses and paramedics. Iraq (11) U.S military War / 2003 212th MASH Emergency room, operating room tables. General surgeons, thoracic surgeon, plastic surgeon, orthopedic surgeon, gynecologist, anesthesiologist, emergency medicine physician, internist, family practitioner, nursing staff from various disciplines. Afghanistan (12) Canadian, forces (CF) surgeons War / 2006 Canadian combat hospital Blood bank, ultrasonography, digital radiography, laboratory services, a CT scanner. general surgeon, orthopedic, Surgeon, Anesthesiologists, Internist, Radiologist, oral surgeon, several family physicians. Syria (13) Doctors without borders (MSF), the Syrian American medical society (SAMS) War / 2011 Syrian field hospitals were established. In hidden places like basements, farm houses, deserted buildings, mosques, churches, and factories. Portable ventilator, cautery 400 watt, portable suction devise 90 L/M 2, Hot air sterilizer 85 L O2 generator machine, - portable X‑ray device with accessories monitor defibrillator, pulse oximeter, abdominal surgical set, minor surgery set, orthopedic set, Ambu bag, laryngoscope, blood pressure device, stethoscope, Oxygen container, head light for surgery, generator, OR table, OR light, OR: operating. Nurse, Surgeons, surgical assistant, anesthesiologist, surgeries to control peripheral or control abdominal surgeries, and burn care. Armenia (7) Israel defense forces (IDF) Earthquake / 1998 Sports hall Triage and emergency department, internal medicine-adults, orthopedics, pediatrics, obstetrics and gynecology, operating theatre, recovery and intensive care, auxiliary services, radiology, laboratory, pharmacy, A logistic support unit included logistics, (i.e. supplies, kitchen, maintenance, communications, security), the command center. Physicians, nurse, medics/paramedics, physical therapists, X- ray technics, lavatory technicians, pharmacists, management, nephrology, pediatrics, orthopedics, general surgery, urology, anesthesia, intensive care, neurology, psychiatry, internal medicine. Turkey (7) Israel defense forces (IDF) Earthquake / 1999 Tent Triage and emergency department, Internal medicine-adults, orthopedics, pediatrics, obstetrics and gynecology, operating theatre, recovery and intensive care, auxiliary services, radiology, laboratory, pharmacy, A logistic support unit included logistics, (i.e. supplies, kitchen, maintenance, communications, security), the command center. Nurse, Medics/paramedics, X-ray technics, lavatory technicians, pharmacists, management, pediatrics, anesthesia, intensive care, neurology, internal medicine. Bam, Iran (1, 8, 9) Iranian military force and rescue team from U.S, teams from the Ukraine, France, British, Spain, and Norway Earthquake / 2003 Tent - Specialists in trauma surgery, obstetrics and gynecology, anesthesiology, primary care, Pediatrics, emergency medicine Physician assistants, emergency room, operating, room, and critical care, members of the team, as were paramedics, pharmacists, respiratory therapists, and logistics personnel. Kashmir, Pakistan (14) Turkish red crescent Earthquake / 2005 Tent Triage, dressing and patient, examination tent, outpatient tent, orthopedic intervention and plastering laboratory tent, roentgen, pharmacy tent, sterilization tent, - operation tents. Physicians, orthopedic and traumatology specialists, one orthopedic and traumatology, nephrologist, pediatric specialist, obstetrics and gynecology specialist, infectious diseases specialist, otolaryngology specialist, radiologist, practitioners, anesthetic technicians, radiology technicians, laboratory technicians, orthopedic technician, nurses. The team was under the supervision of a senior orthopedic and traumatology specialist (MB). Gulf coast region of Mississippi, U.S.A (12) USA(state Medical assistance team) Hurricane Katrina / 2005 Carolinas MED-1 mobile hospital and Tent Emergency department, surgical suite, critical care beds, blood pressure monitoring, pulse oximetry, end-tidal capnometry, 3-lead and 12-lead electrocardiography, continuous ST-segment trend. Analysis: the capabilities of providing arterial, central venous pressure, Swan-Ganz catheter monitoring. emergency physicians, trauma surgeon, orthopedic surgeon, anesthesiologist with augmentation, pediatrics, Family medicine. Sumatra, Indonesia (15) Russian mobile hospital Earthquake / 2009 - Modern medical equipment (X ray ultrasonic diagnostics etc. ), Mobile CT, pneumo modules equipped pneumo modules with technical systems. Engineers, surgeons, therapists, traumatologists, children’s surgeons, pediatrician, anesthesiologists. Chile (16) Cuban medical team Earthquake /2010 Tent A portable X-ray machine, ultrasound, four cardiovascular monitors, ventilators, anesthesia equipment, operating room, installation of indispensable air conditioning units. Orthopedics, surgery, anesthesiology, family medicine, nurses, psychologist and support staff, general surgeons, orthopedic surgeons, anesthesiologists, Scrub nurses to cover positions in regional hospitals with facilities for more complex care but lacking qualified personnel. Haiti (7, 17) Israel defense forces Medical corps field hospital (IDF-MC) Earthquake / 2010 Fully self-sufficient tent encampment Triage and emergency department, Internal medicine-adults, orthopedics, pediatrics, obstetrics and gynecology, operating theatre, recovery and intensive care, auxiliary services, radiology, laboratory, pharmacy, A logistic support unit included logistics(i.e. supplies, kitchen, maintenance, communications, security), the command center. Physicians, nurse, Medics/paramedics, X-ray technics, lavatory technicians, pharmacists, family medicine, pediatrics, orthopedics, general surgery, urology, anesthesia, intensive care, psychiatry, internal medicine, psychiatry. Lushan, China (18) Chinese army forces Earthquake / 2013 Tent Resuscitation and emergency surgery, first-aid materials, X-ray machine, ultrasonic instrument, a clinical laboratory, a mobile operating room. Pediatricians, orthopedists, cerebral surgeons, anesthesiologists, thoracic surgeons, general surgeons, oral and maxillofacial surgeons, otolaryngologist, ophthalmologist, internists, pharmacist, clinical laboratory technician and nurses. Bogo, Philippines (19) Israel defense forces Medical corps field hospital(IDF-MC) Typhoon Haiyan / 2013 Tent Portable Otoscopes, foreign body loops, portable high-quality X-ray and ultrasound machines. Radiologist, anesthesiologist, pediatricians, otolaryngologist, other healthcare personnel. The obtained results showed the war FH used in Korea, Vietnam, Iran, Kuwait, Iraq, Afghanistan, and Syria that were established by the US army, Iranian military force, British Military, Canadian forces, and Syrian American Medical society. On other hand, the military forces were the main organization that provided FH, especially during wars. The organization that provided FHs in natural disasters were IDF, Iranian military force, rescue teams (from U.S and Ukraine, France, British, Spain, and Norway), Turkish red crescent, Russian mobile hospital, Cuban medical team, and Chinese army forces. According to the Geneva convention during war, the parties involved in the war were prohibited to attack doctors, ambulances, hospitals, and medical centers or places where FHs displayed a red cross or red crescent emblems, otherwise, war crimes occurred (1), yet unfortunately this takes place frequently during wars. According to the current study findings, although the tent structures were the most common structures for the establishment of FHs when a disaster occurred, yet based on disaster type, geography and the situation, it may be modified, improved or replaced by other structures. Conex and tents were the first structures used for field hospitals in Iran-Iraq war, yet after the Saddam regime attacked hospitals and medical centers, the was a need to increase the structure resistance against bomb and explosion. To reduce the casualties of the war, Iran had to change the structures of the hospital to steel and concrete structures and also used the principles of passive, defense such as camouflage, simultaneously. In the Syrian war, which was an asymmetric warfare, it was best to use local structures, such as schools, mosques, and so on as a field hospital structure (1). Selecting the type of structure (mobile and fixed) for hospitals clearly depends on the weather conditions, the environment, the type of disaster, the facilities available in the area, the extent and severity of the disaster, etc. Another example for selecting a suitable structure of FH is Syria. The civil war in this country will enter its eighth year. Meanwhile, more than 465,000 Syrians have been killed in the fighting and over a million are injured. In this situation, FH is necessary with special structure. Available reports show that in cities of Aleppo and Damascus, underground FHs are used to protect from bombs. Units of an FH have vital effects on FH efficiency. The results showed recent FHs have various units, while former FHs have no professional staff and medical units. Generally, the establishment of a field hospital should include relief units, diagnostic treatment, emergency room, operating room, intensive care unit, radiology, pharmacy, laboratory and blood bank, sterilization department, special relief and transfer department, burn department and injured C.B.N. In general, the establishment of a field hospital should include relief units, diagnostic treatment, emergency room, operating room, intensive care units, radiology, pharmacy, laboratory and blood bank, sterilization department, special relief and transfer department, burn department and injured C.B.N, and regarding the clinical team, specialists in orthopedic and traumatology, plastic and reconstructive surgery, infectious diseases, general surgery, anesthesia, pediatrics, internal medicine, and obstetrics and gynecology as well as orthopedic, anesthetic, radiology, and laboratory technicians, and nurses. The results (Tables 1 and 2) illustrate that military forces, especially US army, is the most productive organization in FH establishment due to their experience in many disasters. It can be concluded that army forces of each country has an important role in success of FH, thus, collaboration with this organization can help with more success of FH. Table 3 presents the study findings compared with similar studies dealing with FH. Identification of the HF type, equipment and structure are the first step to provide a FH. By using a suitable FH for a disaster, reduces risks by the FH. The present study reviewed available reports on FH to collect useful data that should be considered for an FH preparation. Furthermore, this study provided a list of the most important index that must be considered in proposing a type of FH. The main limitation of the present study was that only internet available reports on FH were included. As the nature of FHs some of cases may be unavailable to general especially FHs used by military forces it may be lost some of the applicable reports which were not available on internet. The authors would like to thank the Trauma research center of Baqiyatallah University of Medical Sciences. Competing Interests: The authors declare that they had no competing interests. Funding/Support: This research was supported non-financially by the Trauma research center of Baqiyatallah University of Medical Sciences. 1. Heidaranlu E, Khankeh H, Ebadi A, Ardalan A. An evaluation of non-structural vulnerabilities of hospitals involved in the 2012 East Azerbaijan earthquake. Trauma Mon. 2016;22(2). doi: 10.5812/traumamon.28590. 2. Zarea K, Beiranvand S, Sheini-Jaberi P, Nikbakht-Nasrabadi A. Disaster nursing in Iran: challenges and opportunities. Australas Emerg Nurs J. 2014;17(4):190-6. doi: 10.1016/j.aenj.2014.05.006. [PubMed: 25440225]. 3. Thomas V, López R. Global increase in climate-related disasters. Asian Development Bank Economics Working Paper Series; 2015. Report No. : No. 466. 4. Zaboli R, Toufighi S, Raiess Zadeh M, Ghaed Amini R, Azizian F. Key performance indicators in field hospital appraisal: A systematic review. Trauma Mon. 2016;23(1). doi: 10.5812/traumamon.42604. 5. Cheng B, Shi RF, Du DY, Hu P, Feng J, Huang GB, et al. Mobile emergency (surgical) hospital: Development and application in medical relief of "4.20" Lushan earthquake in Sichuan Province, China. Chin J Traumatol. 2015;18(1):5-9. doi: 10.1016/j.cjtee.2014.07.004. [PubMed: 26169086]. 6. King B, Jatoi I. The mobile Army surgical hospital (MASH): a military and surgical legacy. J Natl Med Assoc. 2005;97(5):648-56. [PubMed: 15926641]. [PubMed Central: PMC2569328]. 7. Marom T, Dagan D, Weiser G, Mendlovic J, Levy G, Shpriz M, et al. Pediatric otolaryngology in a field hospital in the Philippines. Int J Pediatr Otorhinolaryngol. 2014;78(5):807-11. doi: 10.1016/j.ijporl.2014.02.019. [PubMed: 24656226]. 8. Ramasamy A, Harrisson S, Lasrado I, Stewart MP. A review of casualties during the Iraqi insurgency 2006--a British field hospital experience. Injury. 2009;40(5):493-7. doi: 10.1016/j.injury.2008.03.028. [PubMed: 18656190]. 9. Sankari A, Atassi B, Sahloul MZ. Syrian field hospitals: A creative solution in urban military conflict combat in Syria. Avicenna J Med. 2013;3(3):84-6. doi: 10.4103/2231-0770.118467. [PubMed: 24251237]. [PubMed Central: PMC3818785]. 10. Alahdab F, Omar MH, Alsakka S, Al-Moujahed A, Atassi B. Syrians' alternative to a health care system: "field hospitals". Avicenna J Med. 2014;4(3):51-2. doi: 10.4103/2231-0770.133329. [PubMed: 24982824]. [PubMed Central: PMC4065459]. 11. Bar-On E, Abargel A, Peleg K, Kreiss Y. Coping with the challenges of early disaster response: 24 years of field hospital experience after earthquakes. Disaster Med Public Health Prep. 2013;7(5):491-8. doi: 10.1017/dmp.2013.94. [PubMed: 24135315]. 12. Schnitzer JJ, Briggs SM. Earthquake relief--the U.S. medical response in Bam, Iran. N Engl J Med. 2004;350(12):1174-6. doi: 10.1056/NEJMp048019. [PubMed: 15028821]. 13. Petlakh VI, Bojko NV, Demenko VV, Popov AS. (P1-15) Russian mobile hospital response to the earthquake in Sumatra, Indonesia, October 2009. Prehosp Disaster Med. 2011;26(S1):103. doi: 10.1017/s1049023x11003475. 14. Abolghasemi H, Poorheidari G, Mehrabi A, Foroutan G. Iranian military forces in the Bam earthquake. Mil Med. 2005;170(10):859-61. [PubMed: 16435759]. 15. Bozkurt M, Ocguder A, Turktas U, Erdem M. The evaluation of trauma patients in Turkish Red Crescent Field Hospital following the Pakistan earthquake in 2005. Injury. 2007;38(3):290-7. doi: 10.1016/j.injury.2006.10.013. [PubMed: 17250835]. 16. Blackwell T, Bosse M. Use of an innovative design mobile hospital in the medical response to Hurricane Katrina. Ann Emerg Med. 2007;49(5):580-8. doi: 10.1016/j.annemergmed.2006.06.037. [PubMed: 17141134]. 17. Tien HC, Farrell R, Macdonald J. Preparing Canadian military surgeons for Afghanistan. CMAJ. 2006;175(11):1365. doi: 10.1503/cmaj.061301. [PubMed: 17116900]. [PubMed Central: PMC1635770]. 18. Perez CR. Emergency Response to Earthquake in Chile: Experience of a Cuban Field Hospital. MEDICC Rev. 2015;17(3):39-42. [PubMed: 26947157]. 19. Kreiss Y, Merin O, Peleg K, Levy G, Vinker S, Sagi R, et al. Early disaster response in Haiti: the Israeli field hospital experience. Ann Intern Med. 2010;153(1):45-8. doi: 10.7326/0003-4819-153-1-201007060-00253. [PubMed: 20442270]. 20. Ding H, Fan H, Lv Q, Liu Z, Zhang Y, Hou S. Analyses of the Disease Spectrum of Children After the Lushan Earthquake. Pediatr Emerg Care. 2015;31(7):496-8. doi: 10.1097/PEC.0000000000000482. [PubMed: 26125532]. 21. Burnweit C, Stylianos S. Disaster response in a pediatric field hospital: lessons learned in Haiti. J Pediatr Surg. 2011;46(6):1131-9. doi: 10.1016/j.jpedsurg.2011.03.042. [PubMed: 21683211]. 22. Mallek-Daclin S, Daclin N, Dusserre G, Lhéritier B, Blanchard J, Arnaud I. Maturity model-driven assessment of Field Hospitals. IFAC-PapersOnLine. 2017;50(1):4642-7. doi: 10.1016/j.ifacol.2017.08.685. 23. Salman FS, Gül S. Deployment of field hospitals in mass casualty incidents. Comput Ind Eng. 2014;74:37-51. doi: 10.1016/j.cie.2014.04.020. 24. Bricknell MC. Organisation and design of regular field hospitals. J R Army Med Corps. 2001;147(2):161-7. doi: 10.1136/jramc-147-02-09. [PubMed: 11464407].